I came across The Story of Stuff by Annie Leonard in March 2009, loved it, and immediately had to write about it. In the 20 minute cartoon video Annie describes in clear, simple terms how demand for stuff is created, the life cycle of stuff — all kinds of stuff — and what stuff is doing to our world. Once again, with her characteristic clarity and simplicity, Annie has a tale to tell and this time it’s the Story of Bottled Water. This 8 minute video gives you the basic run-down of how we came to believe that bottled was better than tap, and in what ways this is not true. The issue of bottled water is an important one. If you want to know more, select the “Water” category on LocalDelicious.com where you’ll find articles, movies, and links to related organizations and resources. This entry was posted in Industry Issues, Water and tagged The Story of Stuff, Water on December 7, 2010 by local delicious. Okay, I know I’ve been on a bit of a rant lately about our most precious resource, local water. BUT, before I step down off my soapbox I have to tell you, I’m not the only one! First, the other day I was in a coffee shop and requested a decaf latte and a glass of water. My friend was paying so I didn’t notice until I arrived at our table that she had paid for a bottle of water. I then suggested she take the bottled water, if in fact she would drink it, and went back to the counter to request a glass of water. “Truly, I’d prefer a glass of tap water, no ice,” I said kindly. It was duly poured from the pitcher right in front of the server. As I walked back to my table another patron asked curiously why I had insisted on tap water. “Because Vancouver has great water. Because it’s cleaner than bottled water. Because there are tons of plastic floating in our oceans. Because of the politics around our freedom of access to water. Those are a few of the reasons…” She applauded my insistence and we shared a bonding moment of appreciation for fresh, local, delicious, tap water. Tired of hearing about the problem, but feeling powerless? Stop being powerless! You can make small, easy decisions that support your health, your community, and your right to fresh, clean water. For starters buy safe, reusable bottles (metal, glass, non-BPA plastic)… and use them. If I can do it, you can do it. Then, check out the Tapped website for additional ideas and resources on how to be part of the solution. This entry was posted in Industry Issues, Movies, Water and tagged Water on November 28, 2010 by local delicious. Industrialized food production is a hot topic these days as more and more people learn the truth about what, exactly, is going into their mouths. Typically we think of industrialized food as mega farms that produce miles and miles of the same crop year after year using chemical fertilizers and pesticides. Or factory farms housing thousands of cattle, chickens or pigs in close quarters that are fed growth hormones and antibiotics. But what about water? If you buy bottled water, there’s an excellent chance it was pumped by the hectolitre out of some municipality’s ground water, at little or no cost to the bottling company, without thought for the impact to the local urban and agricultural community, then shipped a lengthy distance to a shop near you by one of only a handful of huge multinational companies who pretty much control the industry. Hmmm, if that’s not the industrialization of water, I’m not sure what to call it. Note: If you’re still drinking bottled water in the mistaken belief it’s better for you, you may want to go easy on the promotional hype and brush up on the facts about bottled water. This entry was posted in Industry Issues, Water and tagged Water on November 21, 2010 by local delicious. Why on Earth is anyone still drinking water bottled in plastic? Not only is it a potential health hazard and more expensive than gasoline, consuming water from plastic water bottles contributes to global warming, environmental pollution and the rampant privatization of water. David Suzuki has been warning us of the ecological damage of bottled water for years. With green practices becoming trendy, consuming bottled water is losing its glamour and quickly becoming a social taboo. Polyethylene terephthalate (PET #1 plastic) is used for single serve plastic water bottles. This type of water bottle has been approved for one-time use only. It has become common practice for many people to unknowingly re-use these plastic bottles. Studies show that bacteria easily breeds in PET plastic bottles when re-used and that re-use may cause DEHA, a carcinogen, to migrate from the plastic into water contained in the bottle. A new 2006 study revealed that significant levels of antimony, a toxic chemical, leaches into water sold in PET plastic bottles. Bisphenal-A is a toxic compound found in polycarbonate (#7 plastic), the rigid, translucent, hard plastic used in 5 gallon water bottles. It is a hormone disruptor that mimics estrogen and is linked to early-onset puberty, declining sperm counts, obesity and the huge increase in breast and prostate cancer. Due to the alarming toxicity of this chemical, in March 2007 a billion-dollar class action suit was filed in Los Angeles against five leading manufacturers of baby bottles containing Bisphenal-A. BPA has been officially banned in Canada as of October 2010. The extortionate price of gas pales in comparison to bottled water. A litre (33.8 ounces) of tap water in Canada costs taxpayers an average of 0.0005 cents. A litre of bottled water sells between $0.50 and $6.00.That makes the markup on one litre of bottled water a whopping 1,000 – 12,000%. More than 1/4 of bottled water consumed by Canadians is simply filtered tap water. In Canada tap water has to meet 160 standards compared to less than half a dozen for bottled water. 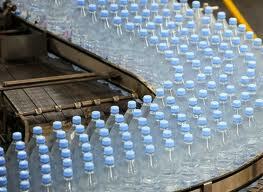 In Canada bottled water is considered a ‘food product’ and is regulated under the Federal Food and Drug Act. Bottled water production facilities are only inspected every 2 – 3 years whereas regular drinking water operators are subject to the Canadian Water Quality Guidelines and must test and report on a regular basis. Contrary to its claims of purity, bottled water is not immune to contamination. A recent US study indicated that 1/3 of all brands tested contained arsenic and/or E.coli and that ¼ of all bottled water was simply tap water sold at a significant profit In March 2007, the Canadian Food Inspection Agency warned the public not to consume imported Jermuk Classic Brand Natural Sparkling Mineral Water because it contained excessive levels of arsenic. In 2004, Coca-Cola recalled its entire Dasani line of bottled water in the UK due to toxic compounds formed in the water during the disinfection process. Learn more. 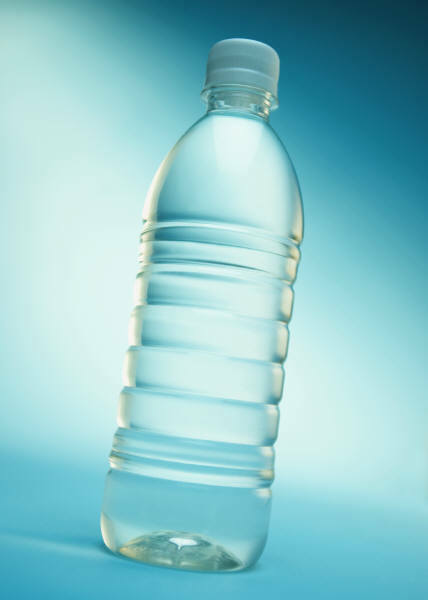 A two-year shelf life is considered acceptable for bottled water. There is no control over the change in the bottled water’s characteristics once it is bottled. 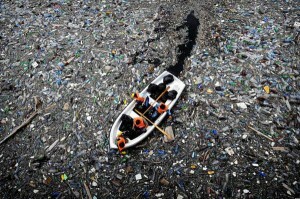 The pollution and energy consumption involved in the production, shipping and disposal of plastic bottles is staggering. “The production of one kilogram of PET plastic requires 17.5 kilograms of water and results in air pollution emissions of over half a dozen significant pollutants. In other words, the water required to create one plastic bottle is significantly more than that bottle will contain” says Rick Smith, Executive Director of Environmental Defense. Plastics are the fastest growing form of municipal waste. They do not biodegrade. An estimated 88% of water bottles are not recycled. Our oceans, now littered with plastic, may be one of the most alarming of environmental concerns today. 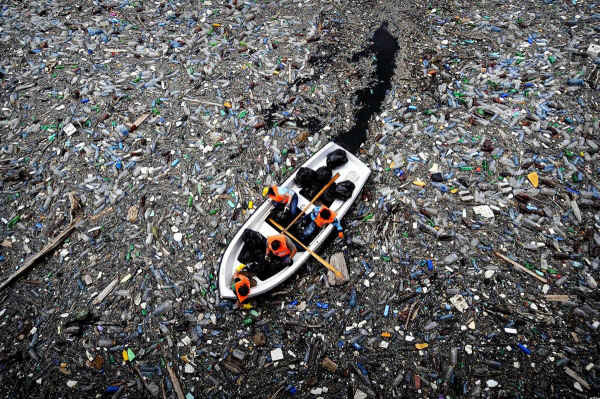 Most plastic floats near the sea surface where it is mistaken for food by birds and fishes. Through the global food chain, it is contaminating trillions upon trillions of ocean inhabitants and ultimately humans. #5 Water Is Getting Scarce – Fast! Severe drought is occurring in many regions around the globe with no sign of letting up. Meanwhile aquifers that can take hundreds of years to recharge have been depleted. Australia is experiencing its fifth consecutive year of drought. Permanent drought is predicted for the Southwestern U.S., much of which has been in severe drought since 2000. Seven American states and Mexico are competing for water from the already over-allocated Colorado River. China is also experiencing ongoing drought. 700 million Chinese lack reliable access to water suitable for human consumption. India is also deeply concerned about lack of water. Sections of Mexico City are sinking at a rate of 12 inches a year due to over-tapping aquifers that have been drained to supply the city’s population of 9 million with water. Meanwhile ‘Big Water’ companies are buying access to and drying up aquifers that have traditionally supplied human populations, farms and ecosystems with water. Current legislation in British Columbia allows companies (including non-Canadian companies) to extract up to 1,710,000 gallons of groundwater per day without a permit and ship it anywhere in the world providing it is in bottles less than 20 litres in size. BC communities, such as Valemont, are loosing their water to profiteering bottled water companies who can take our water with no accountability to the environment or local citizens! This is grossly incongruent with basic ethics, water shortages that are starting to occur within British Columbia and the urgent need to reduce carbon emissions around the globe. Growing populations challenge aging water delivery systems that many local communities and governments cannot afford to update. ‘Big Water’ companies are moving in to take over public water systems in North America. They have plans to control 80% of the public water supply within the next few years. Paying grossly inflated prices for bottled water is intended to seduce us into accepting a transition from unlimited, affordable clean water for all to water becoming an expensive commodity owned and controlled by ‘Big Water’. We complain about gas prices. Why accept water prices that are even higher? Disgracefully, Canada is the one country that has consistently voted against water as a human right at the World Water Forums in 2000, 2003 and 2006 and the 2002 UN Committee on Human Rights. Meanwhile, more than 1/3 of the world’s population lives and dies without access to decent drinking water and sanitation. Concerned groups, like the United Church of Canada, are taking a stand against bottled water on the moral grounds that water is a basic human right, not a commodity to be sold for profit. Once a fashion trend, drinking bottled water will die in disgrace. Like the cigarette, once fashionable and now stigmatized, bottled water is on its way out. You know the story about the frog in the pot. Turn up the heat slowly and he won’t know he needs to get out. Don’t be caught in the heat. Make the switch. The future of life on this planet depends on it. The new wave is health conscious and eco-friendly. Say NO to bottled water. For more information and additional articles and resources, visit Your Water Matters. This entry was posted in Industry Issues, Water and tagged Water on November 15, 2010 by local delicious. The Bumbling Gardener’s garden has recently been outfitted with a sleek set of soaker hoses. As a complement to the rain barrel, which does not provide enough pressure to reach to the end of the soaker hose, we’ll water on a weekly basis and supplement with the rain barrel, on the assumption that we’ll get enough rain during the season to do so. My favourite thing is, you save about 70% of the water you’d use if you watered with a sprinkler and none of it evaporates into the air. I thought the claims were a bit far-fetched, but site after site says the same thing — and what do I know, anyway? The first hose I bought promptly cracked at the nozzle end, but it came with a 4 year guarantee and the store happily exchanged it. When I first laid out the hose it was pretty stiff and unwieldy, so I held it in place with lengths of trimmed tree branches from the compost pile, sunk into the soil. Now that it’s had water run through it a few times, it’s fully pliable and I’ve been able to remove the sticks and reposition as necessary for optimal coverage. 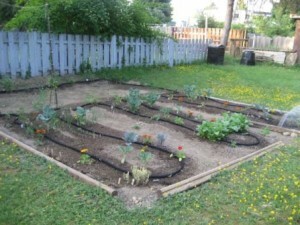 This entry was posted in Bumbling Gardener, Urban Gardening, Water and tagged soaker hose, urban garden, Water on June 10, 2009 by local delicious. I swear, I’m not searching this stuff out, it’s just coming out of the woodwork! I haven’t sent a request for information to anyone, and the friend who sent me this mass-forwarded presentation doesn’t even know I’ve been blogging about water. I can’t vouch for the source of the info, but even if it’s only half or even a quarter true it’s still going to make you stop and contemplate where your water is coming from, how it got to you, and what’s going to happen to the container it came in when you’re done. This entry was posted in General, Video, Water and tagged bottled water, safe drinking water, Water on June 5, 2009 by local delicious. For more info on the issues, check out our posts on the world/local water issue documentaries, Blue Gold and Flow as well. This entry was posted in Industry Issues, Water and tagged Flow, tap water, Water on June 4, 2009 by local delicious. Yeah, you read that title right, “Who owns our water?” If you think that’s like asking “Who owns our air” you’re onto something. Pretty crazy isn’t it? But the weirdest part is, people running big corporations already own some people’s water and are looking to own yours. Then they can sell it to the highest bidder. And, if that isn’t you, you may well be out o’ luck. My switch to local tap water, even on the go, came just before I discovered two documentaries on global and local water issues. Blue Gold and Flow deal with the issue differently, but have the same underlying message — we need to know what’s happening with the water in our world. Note to self: if it can happen in Paris, it can happen here and then some. Not only do the folks behind Flow want you to know what’s happening with water consumption and privatization, they encourage viewers to take action. Whether it’s signing an Article 31 online petition to update the Universal Declaration of Human Rights ensuring access to clean water as a fundamental human right, or connecting with one of the many organizations focused on water issues, the necessary tools to become informed are provided. I suspect like most people, I had a vague sense that water privatization doesn’t seem like a good idea. Now I know why. This entry was posted in Industry Issues, Movies, Water and tagged Flow, fresh water, Irena Salina, UN Article 31, Universal Declaration of Human Rights, Water, water privatization on May 29, 2009 by local delicious.